Viewers Have New Expectations . . .
What exactly is TV these days? The younger the person is that you ask, the more and more you’ll hear an answer that defines television by content that is shown in a series format, not just linear programming through those rigid old pipes. My thirteen year old sister watches more video on her computer than on the television set. That’s probably not surprising to many of you, assuming you’re following recent statistics. However, what I do find surprising about her consumption habits is that she prefers to watch web series rather than high end studio productions on a daily and weekly basis. On an average school night, she often forgets about the television screen all together! The television experience is evolving rapidly in the new millennium. Media stacking tendencies grow with each aging year because entertainment continues to become more accessible through different sources. Dad, it’s not just television, the home telephone and hippie record music anymore; Grandma, we’ve moved passed black and white movies, local restaurants and public radio. All of those traditional forms of entertainment have had to adapt in order to survive. The connectivity of the internet to home computers has changed everything. Get over yourself TV, it’s time to grow up. Millennials seek a more dynamic interaction of entertainment. Something that’s easy and engages the senses. Entertainment is stimuli. Entertainment can be productive, informative, amusing or simply fluid engagement. We have come of age in a time when change is the norm and occurs rapidly, so naturally, we’re more inclined to try new things, think abstractly and reason quickly when problem solving. We are perceived by our elders as having an ADD attention-span, a distinctive characteristic to our generational divide. We’re the fault line, the dawn of always-connected, multitasking iGenerations to come. WISDOM: “Every generation of adults sees new technology–and the social changes it stirs–as a threat to the rightful order of things: Plato warned (correctly) that reading would be the downfall of oral tradition and memory. And every generation of teenagers embraces the freedoms and possibilities wrought by technology in ways that shock the elders: just think about what the automobile did for dating,” (Time Magazine, 2006). OMG, and watch out for the post-internet wave of millennials, born after 1990, raised in a home where internet and cell phones were commonplace amenities, (Jack Myers, The Millennial Myth, July 2012). Sensory, socially and personally relevant entertainment are innate expectations. Brands and services are beginning to extend across platforms, finally accommodating UX to situational circumstances. Let’s talk about video, not TV. There has been a tremendous increase in time-shifting, place-shifting and source-shifting consumption habits since the birth of the internet. Today, it’s personal, with mobile devices offering access to a range of online content sources. For instance, I’m a paying subscriber to services like Hulu Plus, Netflix, Amazon Prime and Cable. I often view videos on open channels like Youtube, Vimeo, Facebook or from custom websites or blogs. 12-17 year olds actively access entertainment via the use of a game console either for watching or playing anywhere in the home and their time spent consuming content in this way outweighs TV or DVR by 3-fold, (Nielsen, 2012). There are several important reasons as to why younger children, pre-teens, teenagers and young adults (Millennials+) are relying on the internet for their entertainment. It’s the go to resource for discovering diversity. Traditional television and primetime series have been reluctant to produce supplemental bridge content for distribution in these online communities, where amateur content has risen to compete for attention and time from their target audience, but they’re beginning to catch up to speed. Fans are requesting additional content. 88% would like to see full-length episodes on their time and on their devices, 75% would enjoy seeing a sneak peek of new episodes, 71% seek out behind-the-scenes extras and 71% watch clip highlights. (Viacom Media Networks, 2012). The younger the person, the more they crave diversity of entertainment and the sooner they grow bored of fixed show schedules. The target age group of TV fans want to engage- during shows, between shows and between seasons! The internet is fluid and dynamic, acting as an open resource where bidirectional communication is the nature of the beast. Ultimately, those revolutionary aspects equate to an experience that traditional television delivery just can’t compete with, without the help of new technology. The internet offers the ability to easily share content with others, whenever interest is sparked. 71% check-in to a show to let their friends know and 64% check in to let other fans of the show know, (Viacom, 2012). Sharing goes way beyond the check-in point. Content can be shared in multiple ways. Share on an intimate delivery level via email, share with friends on closed networks like Facebook or share to the open public by broadcasting your message on twitter or tumblr. 19% of research respondents began watching a show after reading about it on a social network or blog, (Horowitz Associates, 2012) and 47% of the general population visit a social network site during a TV program, (Nielsen, 2012). Sharing can turn viewers into distributors and drive viral tune-in! But, the decision to share is always a personal motivation. Television may be pushed out to the masses, but the reception and internalization of that mass message is unique to each individual viewer, that’s where contextualized interaction of social TV apps can swiftly follow through after the initial pitch. Discovery and consumption of content are often done amongst friends or family on the same couch and in the same viewing period. However, the decision to pursue further, stray away from that shared experience and motivation to share with others are intrinsic pursuits, taken at the individual level. That pursuit to extend the experience, expand your knowledge or enrich in conversation has always been triggered by mass produced television content, but the execution has never been as easy as the tap of a finger. Currently, access to social TV apps are dominated by 82% usage via smartphones and only 18% usage via tablets, (Viacom, 2012). That mobilized and personalized accessibility changes behavior and continues to induce media stacking. In general, people have to be more than curious about something they’re exposed to on television to actually act on that inkling and pursue further. In the past, it had to be worth getting up from the couch and worth turning your back on the television set to search for answers on the home desktop computer. The portability of the laptop made that search process more convenient, but it was essentially still the same browser as before, just juxtaposed in a viewers line of sight to compliment the bigger screen, broadcasting tirelessly in the background. Then the smartphone arrived and the tablet. 44% smartphone penetration in the U.S. by end of 2011. 45% of tablet owners and 41% of smartphone owners use their mobile device while watching TV on a daily basis! (Hill Holliday, 2012). These devices are portable, like a laptop, but their nature has changed the game entirely. The cell phone is attached at the hip to most every modern and young individual. This personalized mobilization doesn’t require a person to rise from the couch and seek their laptop computer in the other room, or battle over the shared desktop, but rather simply extend their arm to access a resource within reach. I would argue that the tablet is becoming a shared entertainment accessory. Tablets are often passed around the couch like a bowl of popcorn. Customized applications are providing bite sized bits of information to viewers that compliment their entertainment experience, rather than interfere, and satisfy the curiosities that TV programs have always transpired. These TV applications have tremendous potential to harness an audience’s attention during viewing, between episodes and between seasons. Shows can live forever if we recognize that tuning out is the silent killer. In conclusion, Viewers Have New Expectations. If traditional TV networks want their brands to survive, they must meet these viewers in the context of their lifestyle, in an accessible, personalized and mobilized way, without breaching the rules of engagement for acceptable contact practices from brands on mobile/social channels. (Jack Myers, The Millennial Myth, http://bit.ly/e0PfF8). Everyone agrees that social TV needs to be measurable. Advertisers need to secure their investments based on return value. A mobile device acts as a digital extension of each individual these days, which means that mobile phones are the gateway to accessing preferences, interests and behaviors that are unique to each individual. Mobile devices and secondary screens will have an essential role in the delivery of interactive multimedia and bidirectional communication by acting as portals to the individual. The mobile device is a pivotal point of access for bidirectional feedback, between the TV and the viewer, and between a company and a consumer. I encounter and hear the same dilemma constantly, that there are so many channels, but there’s nothing on! This perpetual predicament indicates that there is a dire need for services that assist viewers in the “search” process by navigating through content sources. Existing companies across the TV spectrum are investing in technology and new services that help narrow down the plethora of sources by curating content. Currently, a popular form of search is through the use of a word cloud or tag cloud. This visual selection strains metadata down to generate suggestions directly related to the individual’s desired mix. Spotify uses this for it’s radio feature and Cablevision recently launched a channel to help navigate available content in this style. It’s a start, but I’ll be impressed when I’m offered entertainment suggestions from all available sources, such as: linear TV, DVR, On Demand, Pay-per-view, OTT streaming, web UGC, household cloud storage, game consoles, etc… The TV needs to be smart and exploited for its mechanical assets by deploying navigational pivots that intuitively make input switching a stress of the past. TV today is static. The medium is mass-produced and often unrelated to my life on the surface. Search may cater to a viewer’s current mood, but discovery is what encourages the viewer to advance during the decision-making process. I learn about new music via my friends on Spotify and find new photos via my friends on Instagram. Both services are socially powered by leveraging communities on Facebook and Twitter to generate relatable content. Where is the Spotify/Instagram format for TV/Film/Games? The power of peer-to-peer influence can drive new consumers to products and maintain loyal users by providing a social value exchange. Viewers are craving features that help put all that TV static into a dynamic social context. This is the element of “discovery.” In my opinion, discovery occurs when the information presented is surprisingly related to the viewer(s) own preferences and socially comparable to those in their respective network. Keynote speaker at the TVOT show (NYC 2011), Andy Mitchell, displayed a slide that said, “Friend to friend discovery drives more value than your average promotional campaign.” Facebook is a proven source for such social insights. Social discovery will be a key component in the content discovery process of the future. To execute insightful discovery, the connected TV needs to become socially aware by accounting for both the physical and the virtual social experience. The Physical. Decision-making is a frustrating process. Personally, I waste plenty of time searching through content, reading descriptions, watching previews and consulting reviews in order to select something that will also appeal to both my parents and myself, sometimes with a preteen sister in the mix! A true “smart TV” should assist me in this search and discovery process. The connected TV and all OTT services need to be able to account for multiple users. TV communication with surrounding mobile devices can establish the necessary touch-points individually seated on the couch. The smart TV needs to detect surrounding devices, process multiple accounts/preferences, extract value from those data sets and produce recommendations that are customized specifically to the unique viewing group. A true social TV experience will be able to search through all available content, cater suggestions to the physical social group and compare generated content against associated virtual networks. This would truly reduce wasted time in the decision making process, increase users’ enjoyment by serving the physical group interest, facilitate communal content discovery and encourage mobile sharing for all viewers in the physical group. The same multi-user sensory system can propel interactive communication from the main unit (TV) to all peripheral devices (Mobile) to enable gamification, provide companion content and offer contextual commerce. ACR (Automatic Content Recognition) will soon be built into the TV and automatically extend engagement by offering companion content to peripheral mobile screens in the detected network. What technology do you think is best for bidirectional communication in a personalized area network? The Virtual. Virtual communities influence the user(s) in the decision-making process by offering social validations. Validations can emerge from the public (out-group) and from the user’s personalized network (in-group). For example, visible and accessible contributions, like ratings/reviews, are perceived as a credible source because strangers in society become peers in a shared content community. An app given 4 stars from over 2,000 users will impact a potential consumer’s decision to purchase the product because the individual will impulsively acquiesce to the collective groupthink, based on scale. Although there is power in numbers, the true investment value will be in leveraging private social communities, where familiar faces naturally attract attention and interest. Motivation and incentive are heightened when the context of a decision is personalized by emotional connections to real world relationships. Social quality is a trusted in-group source, whereas; social quantity is a credible out-group source because the large scale endorses pubic opinion. Incorporating both public and private communities will offer valuable guidance during the search process and offer influential content suggestions for the multi-user group. 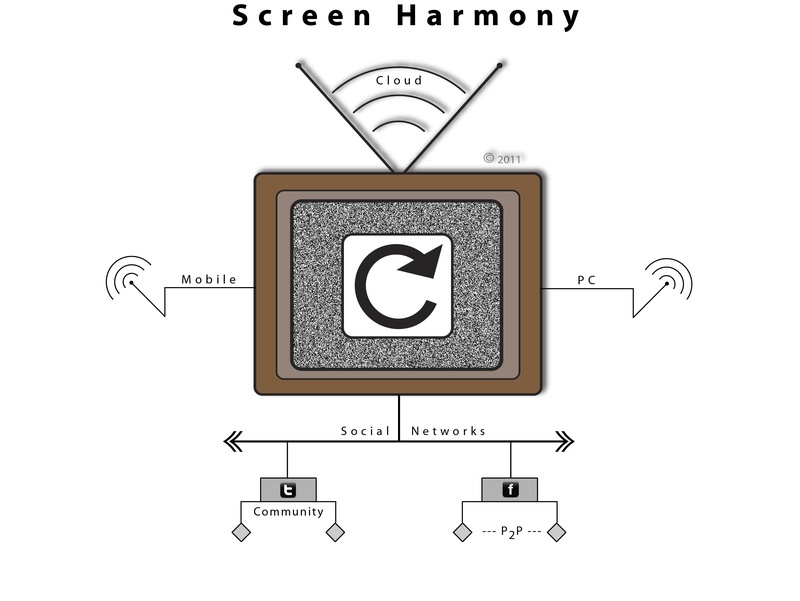 Connected TV needs to establish seamless communication with participating mobile devices. Then the smart TV needs to detect the multiple accounts engaged with their respective various social networks, compare multimedia content relationships on the social graph and extract presentable value. It won’t happen overnight, but refining the search process to become socially aware of both the physical and virtual connections will uncover psychodynamic insights in how information flows as well as perception of multi-device heuristic models. Early models will begin to establish expectations and influence viewers’ behaviors and habits. Connected TV and social TV implementation will lead to targeted marketing campaigns that strategically extend reach across screens and utilize the interactive feedback loop for localized and personalized fulfillment. What do you think? Add to the discussion & comment! Creative Shop’s Brian Smillie and Mark Bailey talk through some innovations they hope will revolutionise advertising in Australia. 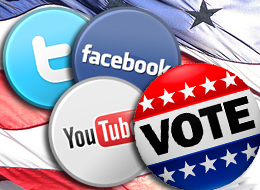 Voters are now more connected to candidates and political discourse than ever before! Social media causes greater awareness of cultural issues and significant events. Social media allows people to discover and contribute to ideological communities where peers value their voices. Broadcasters can amplify communication. Provide participatory channels to enhance live content and moderate public discussion. 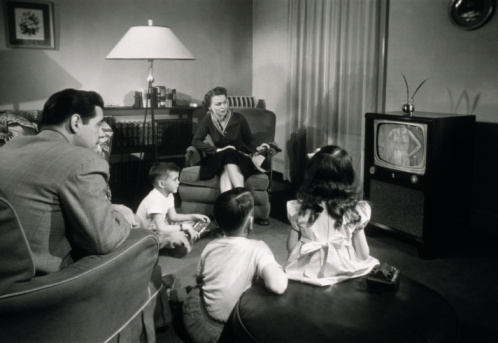 The TV has always been a social scene where families and friends have gathered to be entertained. The large screen leads to high emotional engagement. As a natural entertainment source, people commonly flock toward the shared screen to relax in the company of others. Since the TV is stationary, it is predominately a servant to the household. The physical group often varies with the presence of parents, young adults, children, live-in grandparents or occasionally guests, which causes the viewers to range across generations. The TV interface should strongly consider group demographics and psychodynamics when implementing new social technologies. The Social TV Summit took place on November 16th in New York City. For many, the highlight of the day was the afternoon keynote presentation given by one of the few women attending, Chloe Sladden, Director of Content and Programming at Twitter. Sladden briefly discussed progress made in 2011 with the integration of Twitter into TV content. The use of on-air visual indicators paired with a verbal call to action is a basic programming practice that has accelerated across networks. Sladden referenced statistics. This simple integration into the show content can result in up to a 10-fold increase in Twitter volume, directly and immediately. Moreover, out of the top 50 TV shows, approximately 50% have active brand accounts on Twitter. On air hashtag endorsements, high profile accounts and live tweets have only begun to create the foundation of basic infrastructure between TV and social media. Courageous content producers have taken risks this past year in pursuit of offering their audience an enhanced viewing experience. Live fans have welcomed TV content infused with social media because it transcends the fourth wall by encouraging their participation. Sladden’s excitement peaked when she began outlining the blueprint for Twitter’s broadcast fusion in 2012. She boldly challenged the TV industry to utilize social media by considering revolutionary propositions. First, “make Twitter engagement a peer to Nielsen Ratings,” by perceiving Nielsen as the scientific measurement, like blood pressure; whereas, Twitter is the emotional investment, like one’s heartbeat. It is becoming clear that social buzz is related to ratings. Both brands and producers should consider the social media velocity associated with certain types of programs to plan strategically. Second, “program Twitter like you program your Network,” by beginning to think of your show(s) or brand’s TV content as an experience event. The true potential for groundbreaking engagement dwells amongst the producers, networks and advertising agencies. Optimize live tweeting, write, produce and program your content to design a holistic experience that is significant to the audience. TV may traditionally be categorized as a lean back experience, but certain shows are participatory in nature and yearning to harness social media with multi-screen functionality. Know your content, know your audience; but, above all, learn to embrace your fans! Decide when and how to involve the audience. Social media needs to be used creatively in ways that surprise and delight viewers; therefore, increasing resonance. The third challenge, and according to Sladden, the most difficult for content producers to seize is the ability to, “invite your Twitter audience to become integrated into the show itself.” In the past, TV content has used telephones, SMS text messages and branded websites to add a facet of interaction to static programming. Today’s technology is exponentially developing. Aim to make the interactive element of TV content remarkably creative! Sladden stated that Twitter, “is the real laugh track.” Social traffic spikes during moments of drama or during scenes with heightened emotion. These moments are distinguished because viewers react together, sharing emotions, in a united live experience. I loved Sladden’s enthusiasm when she spoke of how a program, like the political debate, could incorporate live Twitter activity into the show itself. If the hashtags #answer and #dodge were promoted for instantaneous interaction, the audience could offer their judgments as to how well candidates addressed the posed questions. Automatically, I thought of how this type of opinionated participation could enhance other programs, like sporting events on TV. The network would present a question on-air or on the second screen: was the call fair or foul? What if the immediate public response, via twitter or in conjunction with other social media channels, was against the referee’s official decision? How would the fan’s communal opposition change or challenge the outcome? Influence public discussion? Public opinion? This is where producers can put their creativity to the test. As an avid television viewer, I find that TV content becomes much more interesting and engaging if I am emotionally or socially invested to tune in. Broadcasters need to take risks in order to discover the best approach that captures and maintains this type of meaningful investment appropriate for their audience and tailored to their content. Drive tune-in week after week, season after season and year after year. Twitter wants to assist the infiltration of social media into broadcasted programs. The company seeks to collaborate with networks, producers and advertisers with their implementation by providing best practice guidelines. Seek to discover what motivates your viewers and what drives initiative. That is the portal to interactive digital revenue. The best creative storytelling requires risk taking.